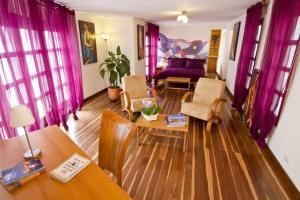 Hotel Casa Deco is perfectly located for both business and leisure guests in Bogota. The hotel offers a wide range of amenities and perks to ensure you have a great time. Free Wi-Fi in all rooms, 24-hour front desk, Wi-Fi in public areas, room service, airport transfer are on the list of things guests can enjoy. Comfortable guestrooms ensure a good night's sleep with some rooms featuring facilities such as internet access – wireless, non smoking rooms, air conditioning, wake-up service, mini bar. The hotel offers various recreational opportunities. Friendly staff, great facilities and close proximity to all that Bogota has to offer are three great reasons you should stay at Hotel Casa Deco.